"How do I make sweet Lassi, Ma?" Hosh asked. "Just like the salted one," answered Isha. "Just substitute sugar for salt, and sweeter ingredients and flavors for sourer one. Change spices appropriately." "Just like salted Lassis, sweet Lassi variants are simple, fast and easy to prepare. They are also cheap, healthy, versatile, nutritious, and wonderfully tasty." "You can also serve them to almost anyone, anywhere, anytime. Even if you are a calorie counter, drinking a Lassi will give you less calories than drinking a chocolate Milkshake." "You can thin out your Lassi too, by adding some cold water, if you are using full fat curd but feeling guilty about calories. If you are using fat free or thinner yoghurt, it is better to skip the water altogether or your Lassi will be too watery." "All Lassis are a perfect drink to have when eating spicy dishes, because yoghourt neutralizes the heat in the spicy dish. Drink it to cool down your mouth and tummy, if a Vindaloo sets them on fire." "All Lassis resemble a milkshake or smoothie and are made the same way, by blending the ingredients. 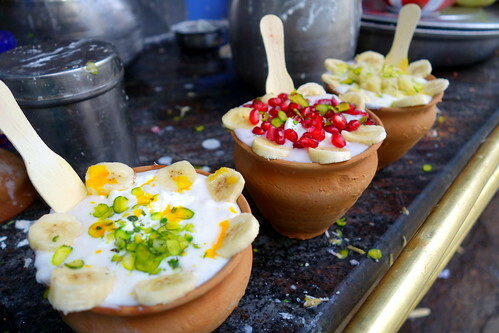 The healthiest variants are when Dahi is blended with fresh fruits like banana." "Bananas are nature's perfect food and very good for your body. Deliciously sweet with firm and creamy flesh, bananas have been a favorite of humanity for over 10,000 years." "Recent archaeological evidence at Kuk Swamp in Papua New Guinea suggests that banana cultivation there goes back to at least 5,000 BCE, and possibly to 8,000 BCE." "Banana plants grow 10 - 26 feet and the fruit is available for harvest throughout the year. The fruit clusters can contain 50 - 150 bananas. Individual fruits are grouped in bunches, called 'hands', containing 10 - 25 bananas each." "Bananas are a great food from infants to elders, because they are soft to eat and a good source of vitamins (C and B6), minerals (Potassium and Manganese), and dietary fiber." "They can taste quite sweet when ripe. Surprisingly though, despite over 10% of their weight being sugar, bananas receive a rating of low in their Glycemic Index (GI) value." "Why's that?" asked Hosh. "Doesn't GI measure the impact of a food on our blood sugar?" "Yea, it does," answered Isha. "Their low GI value is most likely related to their high fiber content, pectin and fructooligosaccharides (FOS)." "Fiber is a nutrient which helps regulate the speed of digestion. By keeping digestion well-regulated, conversion of carbohydrates to simple sugars and release of simple sugars from digesting foods also stays well-regulated." "As bananas ripen, their water-soluble pectins increase. This increase is one of the key reasons why bananas become softer in texture as they ripen." "As their water-soluble pectins increase, so does their relative concentration of fructose in comparison to other sugars. Both these changes help normalize the rate of carbohydrate digestion. Bananas also produce digestive enzymes to assist in absorbing nutrients." "Similarly, FOS are unique fructose-containing carbohydrates that are typically not broken down by enzymes in our digestive tract. Instead, they move along through the digestive tract until they reach our lower intestine and get metabolized by bacteria." "This means bananas act as a prebiotic, stimulating the growth of friendly bacteria (like Bifidobacteria) in our bowels (lower intestine), and as a consequence, it also supports our overall digestive health." "The bottom line here is some surprisingly digestion-friendly consequences for a fruit that might be casually dismissed as being too high in sugar to be digestion-friendly." "Bananas gently chelate toxins and heavy metals from the body. High fiber in bananas can also help normalize bowel motility if one is constipated." "Bananas are soothing to the digestive tract and help restore lost electrolytes after diarrhoea. They are a natural antacid, providing relief from acid reflux, heartburn and GERD." "Did you know bananas are the only raw fruit that can be eaten without distress to relieve stomach ulcers because they coat the stomach linings against corrosive acids?" "No!" he was surprised. "But I knew that despite their rich sweetness, a fresh medium banana contains only about a calorie/gm of mashed banana weight. And bananas are very low in Saturated Fat, Cholesterol and Sodium." "Since one medium-sized banana," she continued after she had finished writing, "contains a whopping 400+ mg of potassium, having bananas in your regular diet may also help prevent high blood pressure, maintain normal heart function and protect against atherosclerosis." "But you can't keep them for long," he protested. "And when they get too ripe, I don't feel like eating them anymore as the peel begins to look dark and ugly." "Freeze them when they go like that," she answered. "They'll still produce brilliant naturally sweet Lassi when blended with Dahi." She ground the ice in a blender and poured it in two empty glasses as she spoke. Meanwhile, Hosh had peeled and roughly sliced the banana, and collected the other ingredients. He then blended the banana with two spoonful curd until it had completely broken down and was well blended. Then pouring the rest of the yogurt in the food processor, he blended it all again for a few seconds to get consistency. Pouring it on ice straightaway and garnishing it, the two walked out into the sunny back garden to enjoy their drink in each other's company.